Nesting: Why Is She Eating Rocks? 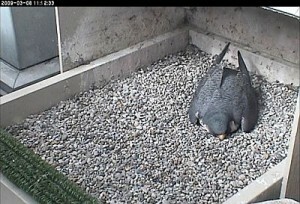 Question: It looks like the female peregrine at University of Pittsburgh is eating rocks from the nest. Is this so? Answer: Peregrines, like all birds, need some grit in their diet to help them digest their meals. Dorothy might be ingesting some pebbles, or she might just be puttering and rearranging the gravel while she hangs out at the nest. Another possibility is this: Before she lays eggs she digs a depression in the gravel called a “scrape” where she will lay her eggs. She does this by propping her chest against one edge of the scrape and pushing the gravel backwards and out with her feet. She may be digging in this picture but because it’s a “still” photo I cannot tell for sure. could you give us a comparison of how large a peregrine’s gizzard is… like the size of a quarter, or nickel, or ???? ?